Rate constants for the reaction between some low-spin Fe(II) complexes of azo amino acids (Fe(II)-Azo complexes) and hydrogen peroxide have been determined in different binary aqueous mixtures. The ligands were derived from the cross coupling reaction of amino acids (DL-phenylalanine, DL-tryptophane, histidine and alanine) with p-nitroso aromatic amines (N,N-dimethylamino-4-nitrosoaniline and N,N-diethylamino-4-nitrosoaniline). Effects of co-organic solvents, Methanol (MeOH) Acetonitrile (AN) Acetone (Act) and Dimethylsulphoxide (DMSO) on the reactivities of Fe(II)-Azo complexes with H-2O2 have been studied in aqueous solutions of pH ˜ 2. Hydrophilic character of Fe(II)-Azo complexes against H2O2 emerges in the general observed decrease in the reactivity as the co-organic solvents are added in little amounts to the aqueous medium. The increase in the chemical potential of H2O2 in the presence of higher concentrations of methanol, acetone, DMSO and acetonitrile enhances the rate constant of the present reaction. The pH profiles exhibit an increase in rate constants with decreasing pH passing through a maximum within pH range (1.5-3). 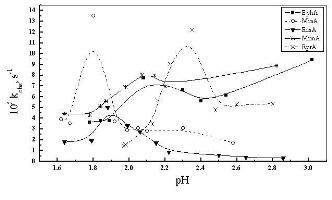 This pattern of pH effect on rates is usually attributed to a protonation equilibrium of these complexes.